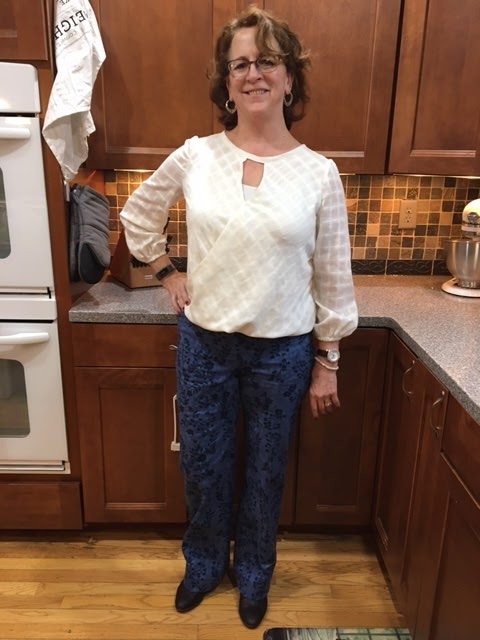 Fabric Mart Fabricistas: Made by a Fabricista: Happy Fri-YAY Clothes! Just like the rest of the world, I love Fridays! I get to wear more casual clothing to work and I daydream about what I am going to sew! For this month's post, I wanted to make a casual Friday outfit. I didn't want just any jeans but some sort of dressier ones--does that make sense? I also wanted a breezy top that was somewhat dressy as well but in some super awesome fabric. 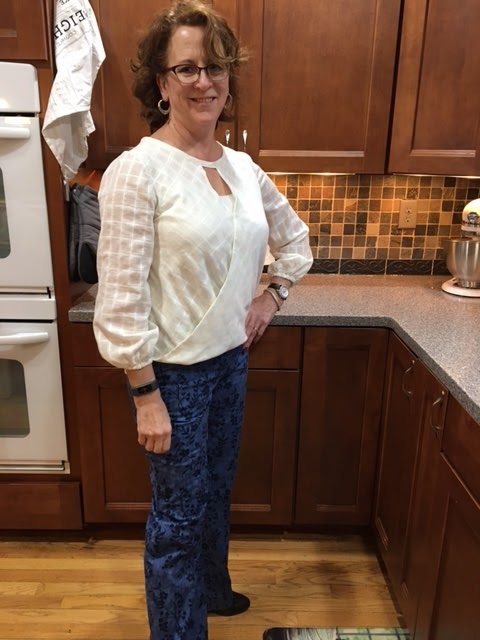 I choose to use the StyleArc Katherine Pant. The legs are what drew me to the pattern--not skinny but also not too wide and those slant pockets are cute. I knew they were just what I wanted to go with this amazing denim. This denim is the perfect weight for these pants and actually, it would work equally well for a shirt dress, jacket, or a structured top. I love that it is printed and the floral design is right up my alley! 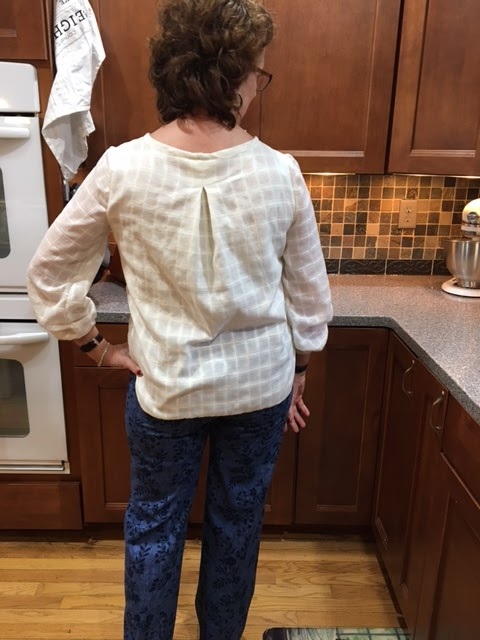 For my top, I used a New Look Pattern that I've tried before and love. It is easy to put together and I thought the texture of the fabric with the draping would be very nice and I am happy with the result. I've always had issues with upper back leg bagginess. 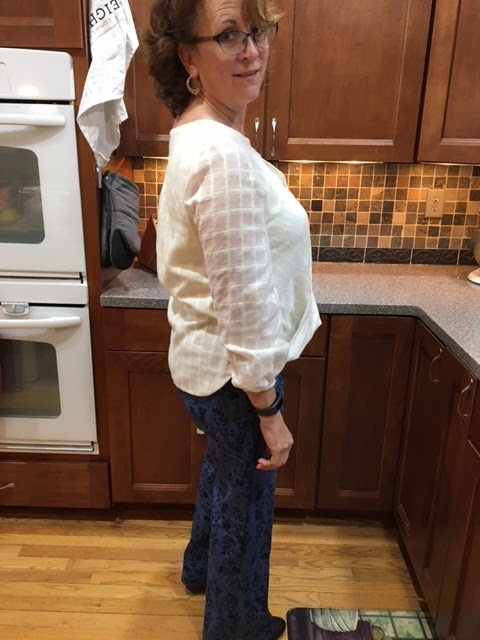 After quite an extensive search, I found a link that talks about reducing that by equally lowering the bottom of the back crotch and also at the waistline. 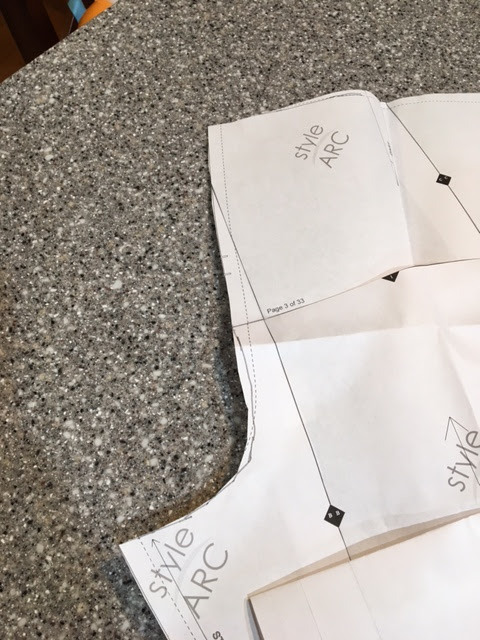 You redraw the crotch to compensate for the lower seam line and then stretch the crotch seam to fit the front leg. You can kind of see what I did above. Sorry I didn't take a before photo! Stretching the inseams so that matched wasn't difficult at all. I think this technique worked well but when I use it again, I am going to try a 1/4" rather than a 1/2" adjustment. I may have gone slightly overboard with the 1/2"! 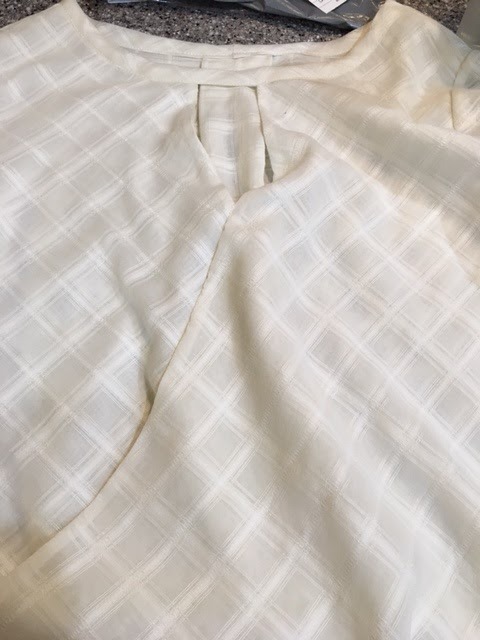 This fabric is from Halston. Do you shop the designer fabrics? This fabric is just so pretty and fun to work with. I used a single-layer for the sleeves, and a double layer for the front and back. 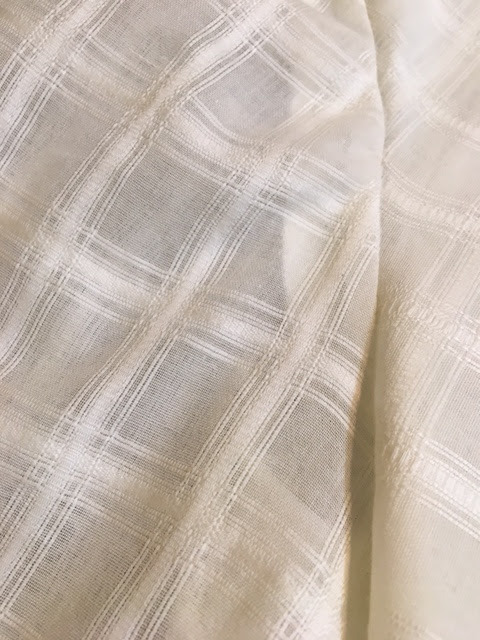 I matched up the 'plaid' lines on the layers so it didn't blur the design. 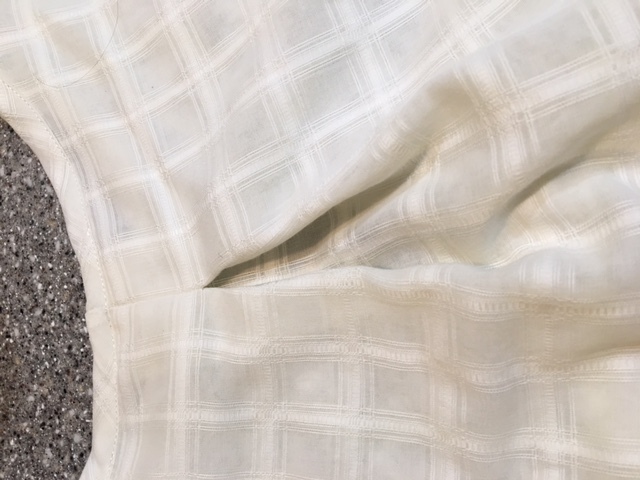 See the wonderful texture in the fabric? 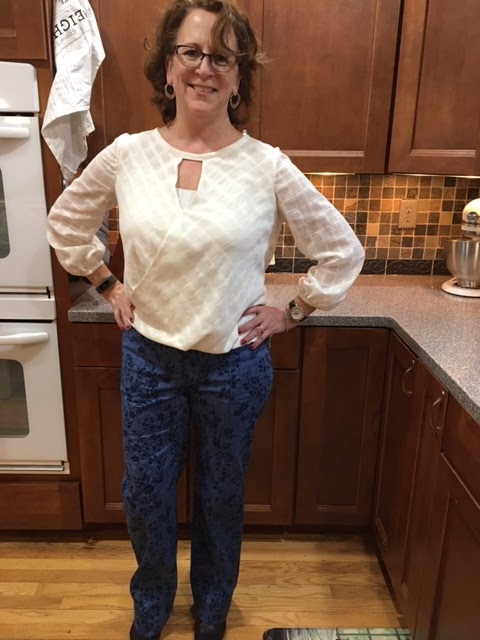 I enjoyed creating this outfit and now need the weather to warm up so I can celebrate a casual Friday in my new outfit! Very nice Sue! I recognized the shirt pattern immediately. Great job! Beautiful job, and your makes look lovely on you. 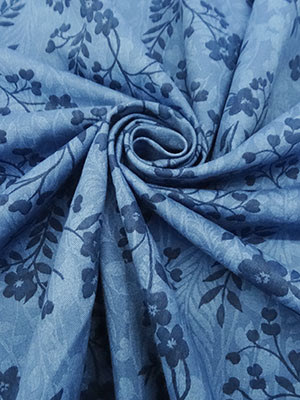 Especially nice is how you have chosen fabrics that compliment your pattern choices. Love the outfit. Esp. the denim. Where did you find the info on removing the baggies in the bag leg? I have that problem too. Please share. I too would like to know where you found the guidelines for removing bagginess in the leg. 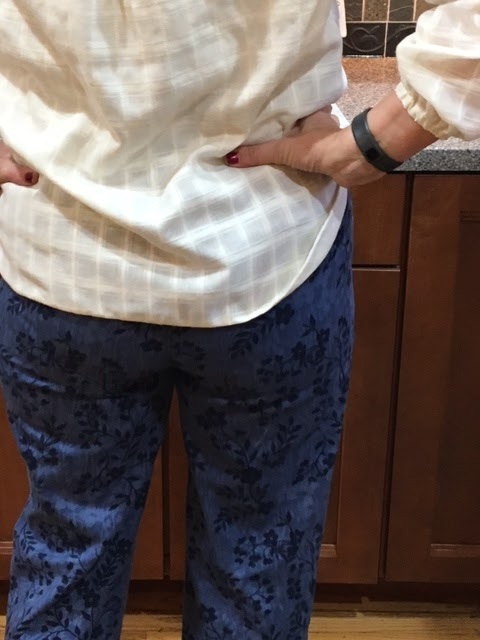 I rarely am able to find a commercial pant that fits properly in the legs; I am also short. I can handle the adjustments for being short, but it only adds to the improper fit throughout the leg. I found that tutorial at Closet Case files. It is very helpful. 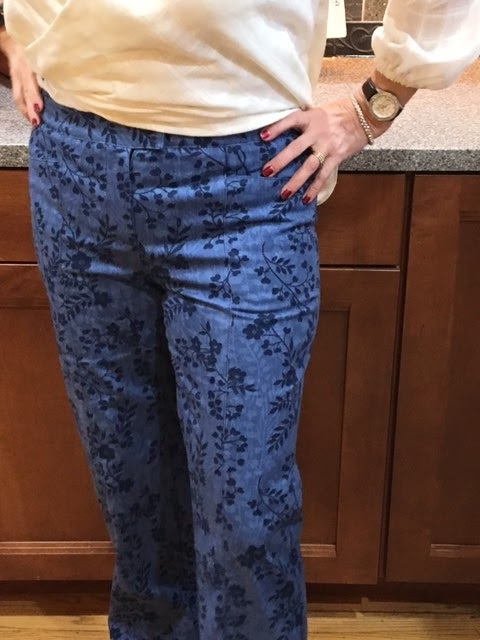 Click on the jeans fitting and I believe it is tutorial #5. I hope it works for you ladies!